Roy Williams to Retire after 2012-2013 Season...? 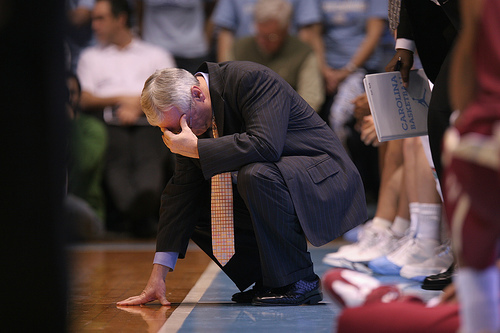 > News > Roy Williams to Retire after 2012-2013 Season...? Roy Williams may be considered one of America's premier college basketball coaches, but there is no denying that the Tar Heels have struggled under his tutelage the last few years. Roy, a native North Carolina boy, has struggled with vertigo and other health issues over the last few seasons. It has been obvious that there has been a lack of passion and lack of court aggression by the Tar Heels the last few season, which has a lot of UNC fans talking about how something is bad wrong. Here we are only days from the start of ACC conference play with a tip-off against the Cavaliers on January 6th. The Tar Heels are out of the top 25 and starting conference play with a 10 -3 record, and a distinct possibility of once again not making the NCAA tournament. Yes...I know it's early for such a bold prediction, but the team once again looks uninspired and Roy appears to lack the energy to finish among the top in the ACC. Now let's flash forward to 2013 - 2014 season. I'm going to make an even bolder prediction and state that Hubert Davis will be at the helm by June 2013. There seems to be no other explanation for why Hubert, also a North Carolina native, would leave such a cushy job at ESPN to engage on the turmoil of coaching. There has to be a promise looming, guaranteeing Hubert the head coaching position at his alma mater. I personally think it would be a fantastic move for a top national program that has fallen from grace over the last few years. Regardless of what actually pans out, change is needed at UNC. Though Roy has won an impressive 2 national titles during his tenure at UNC, the Heels future does not look bright. I for one would welcome Hubert as the head coach. He is intelligent, passionate and an integral part of UNC College Basketball history.